From shelter pets to stars, two area puppies have been selected to appear on Animal Planet’s annual Super Bowl spoof — The Puppy Bowl. Carson, aka "Teddy", is one of two local puppies to star in Animal Planet's Puppy Bowl XIII this year. He and fellow pup Woody were selected by the show from Barktown Rescue. Both have been adopted. Woody, aka "Buck", is one of two local puppies to be featured on Animal Planet's Puppy Bowl XIII. The Super Bowl spoof airs 2 p.m. Feb. 5. “We’ve had two puppies selected every year,” said Heather Nelson, vice president of Barktown Rescue where the local puppies were selected from. This is the third time Barktown has been contacted by the show. Nelson said the Boston-based rescue is the only Kentucky rescue featured in this year’s program. After being contacted by Animal Planet and submitting photos of some of their residents, Nelson said two pups were selected to come to New York. Nelson and Barktown President Suzanne Bridwell, as well as another volunteer, drove the dogs to the filming site. The stars, Woody and Carson, took part in a 12-hour shoot for the program, joining about 78 other dogs selected from around the country. The focus of the program is to not only provide a whimsical alternative for sports and animal lovers, but to promote animal adoptions and help lessen the strain on overcrowded shelter facilities. Fortunately for the Kentucky stars, both were selected for homes prior to the show announcement. Alexander, of Cox’s Creek, said the family wasn’t looking to adopt a puppy, but met Carson, a westie/yorkie mix, and immediately fell in love. “He was so cute and sweet,” she said. Woody, now called “Buck” by his new family, was adopted by Kayla Curtsinger of Louisville. Curtsinger said the family hadn’t intended on adopting a dog at all, and weren’t looking. But a friend from work was fostering Woody, a heeler mix, and the connection was instant. Both dogs have found forever homes, and Barktown hopes by participating in the show again this year, the word of adoption will spread further. 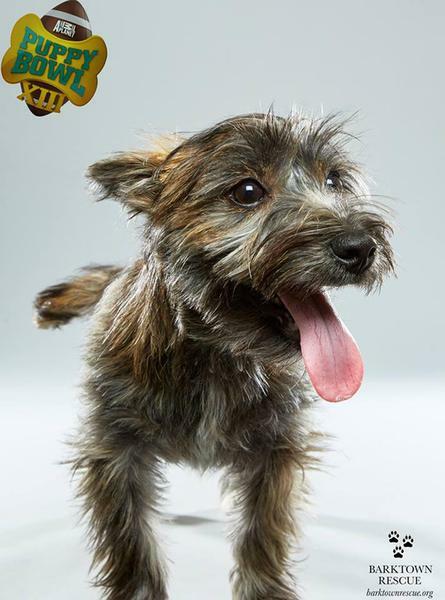 Puppy Bowl XIII will air on Animal Planet Sunday, Feb. 5 with programming kicking off at 2 p.m. The show will repeat throughout the day. Barktown Rescue will host a special Puppy Bowl viewing party from 1-6 that day at Beef ‘O’Brady’s of Hillview, located at 11324 Preston Highway. The event, which will also serve as a fundraiser, will include raffles, drinks and more. 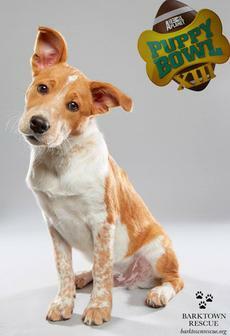 Additional information on the Puppy Bowl can be found at www.animalplanet.com, and information on Barktown Rescue can be found at www.barktownrescue.org.